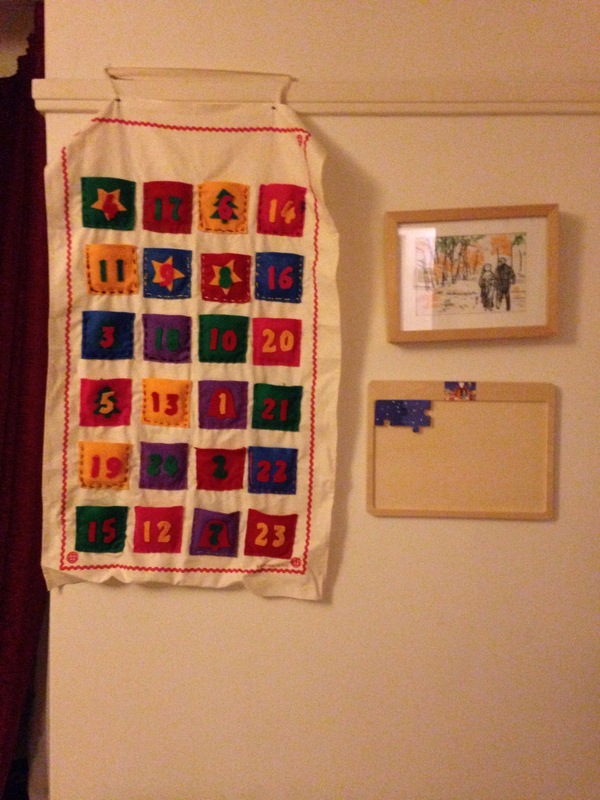 Two years ago in a fit of mania brought on by son1’s birth and much sleep deprivation I sewed together this advent calendar. I think it had something to do with wanting to do something lasting for our children and also wanting to cling tightly to my love of advent in the sea of unknown I found myself in. Last year son1 didn’t really know what was going on and we attempted to put bible verses in for each day and, as I recall, an attempt to listen to a bit of the Messiah each day. The best laid plans didn’t work and I found many unopened Bible verses when I got it out this year. Son1 is getting hold of Christmas for the first time this year. He looks at the lights and the trees and decorations and knows they are about this new word in his vocabulary. He made an advent star with the characters from the nativity in Sunday school this week and can name them all with much glee. I’m excited to try and help him deal with the point of it all each year and want to do all we can to make sure it doesn’t get lost in the midst of the getting of presents. I still struggle with this massively and I want to help our family enjoy and embrace this season whilst holding back on the greed aspect. I realise that starts in my heart first. Anyway. Back to the point. This years advent calendar fits with the simplicity needed in these weary days. Husbandface had the genius idea of getting a 24 piece nativity jigsaw and putting it together over the month. I loved it, we found a jigsaw puzzle that met the description and as our son loves puzzles so much we now have a slight meltdown each night that we can’t do it all at once. Sigh. It remains a good idea and as son2, and no doubt chocolate, get added over the years I hope it makes up part of our traditions as we look to the mystery revealed at Christmas of the word becoming flesh and making his dwelling amongst us. As we long for the day when the puzzle pieces of life will finally fit together. 1 Response to The advent calendar. Oh my goodness, Kath! I love that! Not cheesy at all. Yes, yes, we long for that day!